Shred Nations’ entire focus is on the financial success of our Partners. If we can help you find profitable ways to utilize your shredding trucks, we will. By looking at factors such as creating route density, making multiple stops in an office building, and driving only to remote areas when the job is guaranteed to be profitable – we strive to think outside the shredding box. One aspect of the business which is becoming increasingly popular is to host Shred Events in the evenings and on weekends when your trucks are idle. Who is sponsoring the event and what is their end goal? For instance, there is a big difference between an event sponsored by a downtown bank/financial institution as opposed to an event put on by a local Little League baseball team for fundraising. The bank most likely already has media partners in place who will reach out to the public and drive up the number of boxes to be destroyed. The baseball team may need new uniforms and expect a portion of the proceeds to go directly to them. They probably don’t have an advertising budget and expect you to get the word out. What is the economics of the event for you? 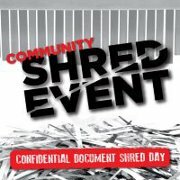 How are you being compensated for your presence at the Shred Event? Do you charge by the hour, by the box, or simply a flat fee for the event? Is the potential exposure worth doing it for free? Can you offer your services to a non-profit organization and write it off as a way to give back to the community? You could decide based on a gut feeling, but we recommend you do a cost/benefit analysis before signing on the dotted line. Where is the event located? What is the date? Since you have a limited opportunity to do a Shred Event (limited by the number of trucks you own and the availability of drivers) you need to consider where and when the event is going to take place. It’s much easier to make money someplace close to your plant and visible, then driving to a remote location. Do you have the manpower to spare? How long is the event scheduled for? Since the event is about generating revenue/buzz for your company, it’s important to understand how long the organization expects your shredding truck to be at the event. Does the customer have clear cut expectations of what is involved? After all, time is money. Setting Proper Expectations. It’s important for you to emphasize to your client how long it takes to shred a box of paper and for them to understand your expectations. Will you issue a certificate of destruction to each individual customer? Will you tip the bin between each client? These are important points of fact to share with your vendor prior to the Shred Event. No one wants to go away from the event feeling unsatisfied. At Shred Nations, our focus is to provide you with as many opportunities as we can to generate revenue for your business. Shredding Events should be profitable, but they are also a chance for your company to spread knowledge of identity theft and convey the importance of secure destruction. They are also a chance for you to create brand awareness by being in front of new customers and communities who may be connected to businesses that will have a need in the future. You must have well defined goals to make the most of these opportunities. Is the immediate revenue more important or is the low-cost advertising what drives your decision? Either way you go, the opportunities are REAL and the advantages are plentiful. We can help you. SHRED ON!